NES Super C (USA) "pacifist" in 12:29.95 by Soig. The guys who have an infinite supply of ammo and who destroy worlds bare-chested are back! 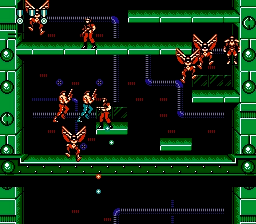 Super C is completed as fast as possible, with an additional goal: do not kill enemies directly unless absolutely necessary to complete the game. By using two players, self-sacrifice, and a number of new discoveries, Soig saves 51.44 over the previous movie by Heidman. If pacifism isn't your style, you can check out these one-player and two-player runs.